With ProCredit, we are currently looking at three countries inwhich to establish an adoption scheme for a branch of NovoBanco. These countries are Mozambique, Congo and Angola. With your help more branches will be established to fulfill the mission of giving access to proper financial services to micro, small and medium sized enterprises. The first bank branch you can help adopt is a new branch in Chimoio, Mozambique. This branch was opened on November 19th, 2004. With your sponsorship you will support the further establishing of this bank branch and thus give many micro and small entrepreneur the opportunity to grow and expand their businesses. 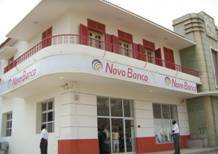 NovoBanco Mozambique has been established in 2000 by several multilateral and bilateral institutions in order to provide reliable financial services specifically tailored to its target group, the micro, small and medium enterprises of Mozambique. All of the shareholders are committed to the goal of developing NovoBanco into a full fledged commercial bank. In August 2004 the bank had a portfolio of 10,750 outstanding loans. These loans are typically quite small, 300-400 EUROS on average however this is usually enough to provide locals the chance to develop their own small business.